This software named Folder Vault, the function of this software is able to guess the lock and hide, either the shape file, the video files, music and more. This software is very useful for you to use a computer that can be accessed by anyone, such as in offices, schools and so forth. Of course you do not want to file a personal views by your fellow worker is not it? So it this software collection, while only a free blog at cool this one .... He ... 3x! Folder Vault is a file-security program allowing the user to hide, lock, encrypt and protect files and folders in the blink of an eye. 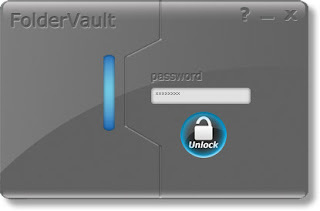 Folder Vault uses advanced folder locking & hiding technology to password protect folders and files, and the advantages of this folder vault is stealth program that is activated when the software folder vault is not visible on your computer !.